The University of Surrey Blog supported by the Leverhulme Trust –Women’s Literary Culture and the Medieval Canon has kindly asked me to contribute another guest post. 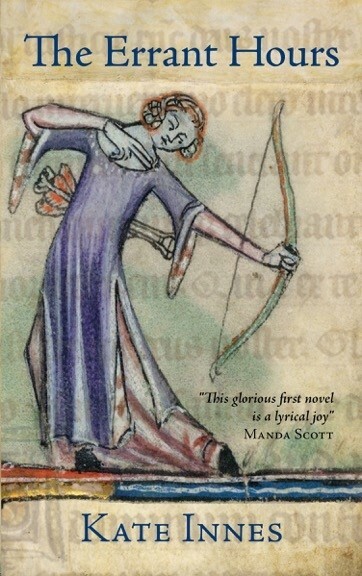 I took the opportunity to explore the literature which informed the second part of ‘The Errant Hours’ – an intriguing mix of Courtly Romance, Warrior-culture and Celtic Religion, which in the end, is both comic and tragic. Sounds complex? Let me try to explain . . . In my last blog in May, I wrote about literature celebrating Virgin Martyrs in the first part of my medieval novel, The Errant Hours. In this post, I will focus on the Arthurian legend – The Knight with the Lion/The Lady of the Well, which informed the second part. 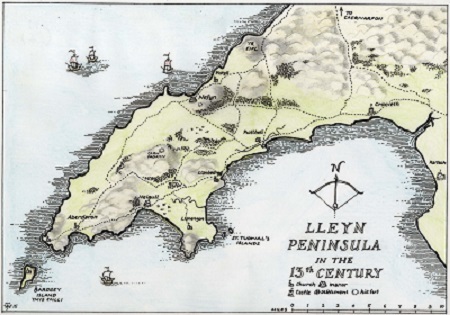 The location of the novel moves from Shropshire to the Lleyn Peninsula in North Wales in this section, because King Edward I organised a Round Table at Nefyn in 1284. This Tournament took place after the conquest of Wales in the second Welsh War (1282-3). Edward I was an Arthurian enthusiast. He recognised the power of the myth and its flexibility. By holding an Arthurian Tournament, he knew he could cast himself as the ‘New Arthur’ uniting the kingdom under his rule. And by inviting lots of nobles from Ireland and the Continent, he could indulge in some status display and conspicuous consumption. Edward used this myth again and again, to signal his right to rule Wales and Scotland and to be served faithfully. 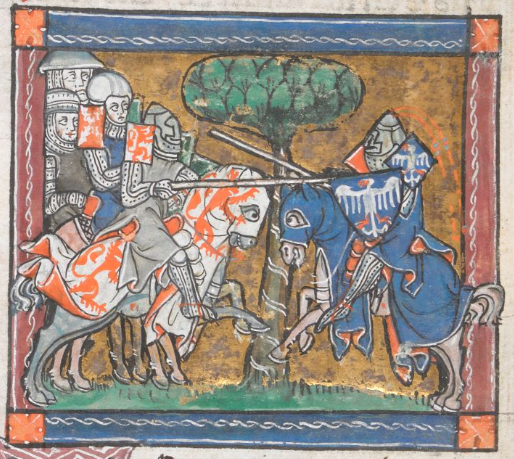 There are very few specific descriptions of what happened at the Round Table in Wales, but, based on accounts of other such events, there was probably a mêlée, a jousting competition, dancing, games and re-enactments of Arthurian stories. And what stories they would have been! Confusing/fascinating/gruesome conglomerations of Warrior culture, Romance and Religion. My interest in this body of literature is in the role women play, the expectations placed upon them and the way they react. It is very well reported that medieval women were treated as chattels, that they had no rights to hold property of their own whilst married. Misogyny was promoted in churches, stories and art. Women were portrayed as temptresses – out to snare and entrap, conceal and emasculate. But Courtly Love was also a powerful influence, encapsulated in the Romance of the Rose. Many women did run businesses, control large estates and affect political outcomes. The cult of the Virgin Mary was at its height. Medieval women were presented as both holy and fallen, powerful and weak, to be cherished and to be condemned. Chrétien de Troyes’ Arthurian Romances were the most popular of the Arthurian myths at the end of the 13th century, so I knew the play at the Tournament should come from this collection. The re-enactment had to have something to offer the King – a regal piece of stagecraft to massage his ego and proclaim his authority. But I also wanted a story that would reflect on the situation and role of the heroine of the novel. As I explained in my first post, Illesa is a young woman on a dangerous journey, during which she comes of age. The play provides the background to the loss of her naïveté, and the start of her resolve to maintain control over at least a portion of her life, through subterfuge and cunning. In the end, I chose Chrétien’s ‘The Knight with the Lion’ – a tale almost identical in plot to the story of ‘The Lady of the Well’ from The Mabinogion. In summary, the Knight Yvain (Owain in the Welsh version) goes forth, seeking a worthy opponent. He is directed to a fountain (or well) in a distant land, and instructed to pour water from it onto a flat stone with a silver bowl. Once done, a thunderstorm presages the arrival of a Black Knight on a Black Horse, who issues a challenge to Yvain, the invader of his territory. Yvain fatally wounds the Black Knight, and pursues him back to his castle. The portcullis comes down on Yvain’s horse, killing it and trapping him between the two gates. So far – so knightly. But from this point, the story becomes more interesting. Enter Lunette. Lunette has met Yvain before, he treated her well when she visited King Arthur’s court. She, at this point in the tale, is a morally ambiguous go-between character. She is not powerful in status – but in wit, not a romantic interest – but a friend. Her intervention with a magic invisibility ring saves Yvain’s life. But when she brings Yvain into the castle, there are some unintended consequences. Yvain sees the wife of the Black Knight mourning over the body of her husband, and is immediately filled with passionate ‘love’ for her. The Lady Laudine rends her clothes, her hair and her flesh in grief for her husband. But this does not put Yvain off. He is determined to have her, and Lunette, Laudine’s handmaiden, agrees to help him accomplish this. 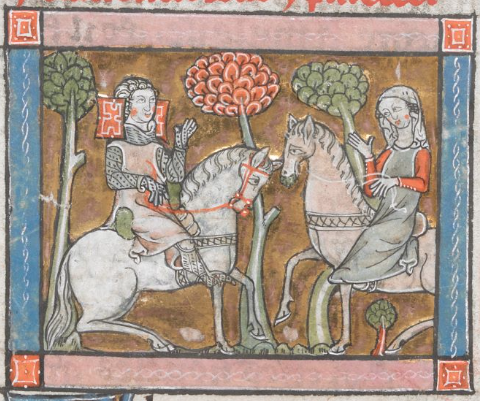 Lunette uses the argument that Laudine should accept the hand of the knight who can defend her people and her land, (it is her land, now that she is a widow). She needs someone to keep the territory by force of arms, and Yvain, the man who bested her husband, is the obvious choice. The story goes on to show Laudine’s change of heart, her marriage to Yvain, and the arrival of King Arthur and his knights to join in the feasting. For Yvain has won the land not just for himself, but also for his tribe – Arthur and his court. At this point, the story is only just beginning. It goes on to be a typical tale of boy gets girl, boy loses girl, boy gets girl again, but with many duels to the death, supernatural serpents and, of course, a lion. What interested me was the characterisation of Laudine, and to a lesser degree Lunette. I asked myself: What circumstances would induce a woman to marry the man who murdered her husband? In order to answer this, I began researching the origins of the tale, which is based on people in 6th century Britain, a time when Christianity was only just beginning to reclaim some power after the Roman retreat. British tribes clung on against the Angles and Saxons from centres in Wales and Scotland. Descriptions of bloody battles are the main form of literature from the time. Yvain/Owain is one of the very few Arthurian characters with an actual historical presence. He is Owain mab Urien, a warrior of Rheged in the mid 6th century, written of by Taliesin. And he has some crimes under his belt. He is said to have disguised himself as a woman in order to enter the chamber of his cousin Thenew (Teneu/Denw), whom he raped. 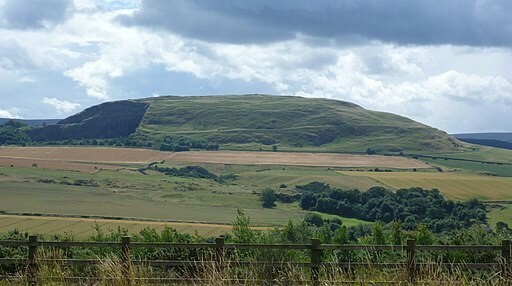 When Thenew’s father Lleuddun (Lot of Lothian) discovered she was pregnant, he had her thrown off Trapian Law, the Gododdin tribe’s hill-fort. She miraculously survived, but that was not good enough for her father, who had her set adrift on the sea in a coracle. When she arrived at Culross she was taken in by a local saint and gave birth to Kentigern, who later became St Mungo, patron saint of Glasgow. Teneu also became a saint, in Wales, and taught St Winifride. Obviously much of this is accumulated legend upon story. But it points to the type of society in which an historical Laudine would be making decisions about whom to marry and how to protect herself and her people. Celtic belief, in as much as we can understand it with so few written records, placed great importance on sacred springs and wells. They were considered gateways between the worlds, places where communication with spirits was easier. The majority of Celtic water deities were female, and associated with healing as well as regeneration. It was common for springs to be repurposed by the early Christians, who claimed them for local saints. 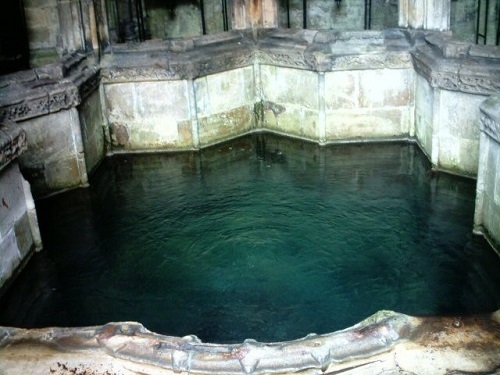 Winifride’s Holywell is perhaps the most famous. In the tale of Yvain and Laudine, the emphasis on, and centrality of, the Lady and her Well and its role in protecting the land seemed to indicate a Pagan/Celtic holy well which was kept by a priestess. Once I had understood this basis to the tale, the power structure of it shifted. Laudine may not have physical power, but there was supernatural power to draw from, and I was intrigued to explore how she might exploit it. For example offerings and messages were (and still are) thrown into springs for gods and spirits. In many springs, including Sulis Minerva in Bath, there have been numerous discoveries including lead curse tablets written backwards, detailing the punishment to be meted out the wrongdoer and folded over so that only the god could read them. When the Christian saints took over the springs, different offerings and different petitions were made, but they came from the same spiritual instinct. So, in The Errant Hours, a re-enactment of story of Yvain and The Lady of the Well is performed for the King, narrated by Lunette, who is played by a cross-dressing actor who decides to sabotage the play in order to punish his lover. But it is also told as it may have happened in the 6th century to a woman whose husband is killed and who must protect her family and her people by taking the murderer to her bed, whilst planning a chilling revenge. These tales can carry innumerable retellings because they are so rich in symbolism, so elemental, so visceral in their conclusion that life is short, brutal and beautiful, and that men and women will struggle to survive through strategies both cultural and instinctive.